As another day nears its end in the prairie Province of Manitoba, Canada, the sky is illuminated in a mass of stunning colors. Bright yellow, orange, blue and purple hues filter through the cloud formations which could bring with them an overnight storm. Not all of these dark cloud formations will bring in a storm, but when they do, at least the sunset hues are spectacular before the rain moves in. 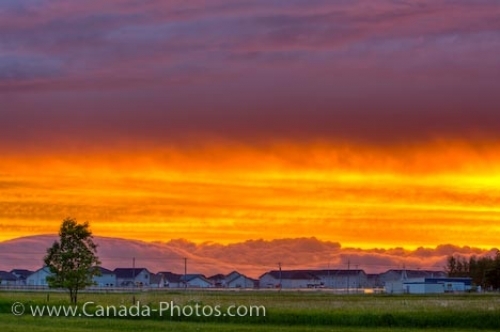 Weather patterns change quickly across the prairies and a sunset such as this one provides happiness in the world of photography. Cold winters and warm dry summers are what the busy City of Winnipeg deals with throughout the year but the prairie sunsets are something which helps people stop to enjoy the beauty of their city. Picture of the cloud formations and beautiful sunset colors over the prairie landscape in the City of Winnipeg, Manitoba.